Ensconced in the azure blue waters of the Mediterranean and surrounded by fabulous cities such as Rome, Naples, Barcelona, Valencia, and Marseille, one is tempted to imagine a blissfully idyllic existence on the island of Sardinia, but it is home to one of the most industrious and prolific modern classical on the scene today in Stefano Guzzetti. In addition to scores & sound design for short films, applications, and video games, he has put out 3 full-length releases in 2016, the most recent being Escape (music for a ballet), which features music he composed for the ‘Escape’ aerial dance performance by LCP Dance Theatre performed in London and at Edinburgh Fringe Festival. As a result of positive feedback from those shows, he edited and distilled the music into shorter pieces suitable for an album-like listening experience and offered them in an eye-catching CD package. The incandescent colors of the stunning artwork by Mario Fois matches the vibrant quality of the music so rich in eloquent melodies and dynamic rhythms and enhanced by electronics which hearken back to Guzzetti’s earlier recordings under the moniker Waves on Canvas. This energy is tempered by dramatic undercurrent suitable to the theme of the dance, which is meant to draw awareness to human rights by depicting a refugee’s journey through “struggle, despair and the search for freedom”. Even without the visual narrative, Escape makes for poignant and compelling listening and ultimately soars with its transcendent beauty. 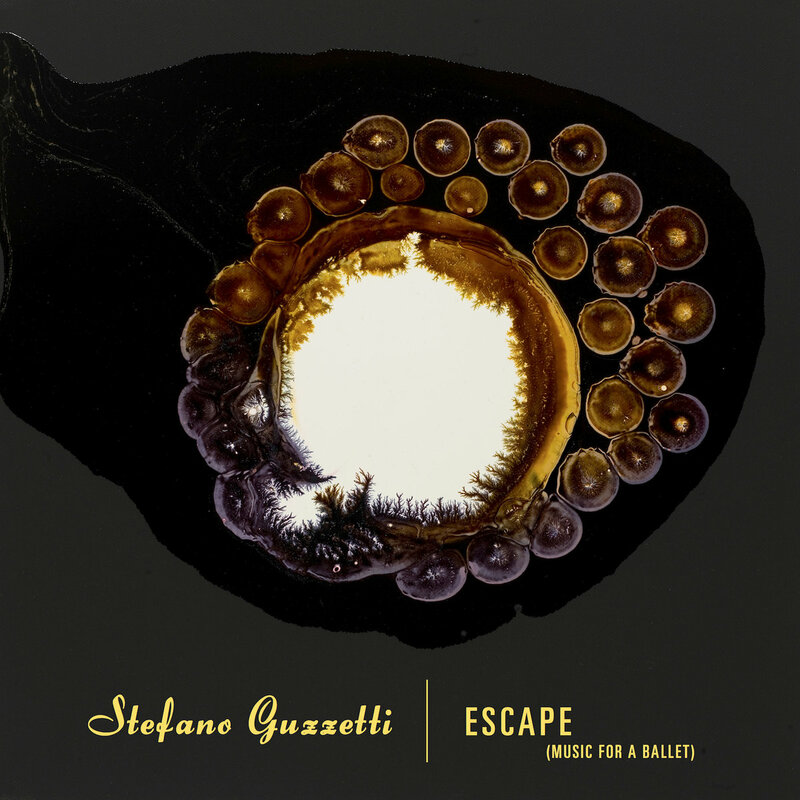 Escape (music for a ballet) is available from Guzzetti’s own Stella Recordings in a limited hand-made & numbered CD edition (200 copies) which includes three postcards, a four page booklet, and a download all sealed in original Japanese vinyl-replica-cd pvc bags. A digital only edition is also available. Additonal musicians featured on the record are Simone Soro (violin ), Giulia Dessy (viola ), Gianluca Pischedda (cello), Francesco Sergi (double bass), and Sara Ambu (flute). Another release not to be missed is Leaf which Guzzetti actually composed in the first half of 2014 and was mastered by Ian Hawgood (Home Normal) in 2015 before seeing a Japanese-only release at the start of the year. This was followed in March by an edition with completely new design by Vaughan Oliver and Ivan Katsarov and featuring lavish artwork by Claudia Pomowski. Absent of percussion and electronics, Leaf is a more romantic and effusive affair, a gorgeous collection that should captivate any fan of modern classical music from start to finish. The middle sequence of “Mother”, “Shoreline”, and “Feather” is especially sublime. Leaf comes in an elaborate vinyl-replica gatefold CD edition featuring artwork by renowned British graphic designer Vaughan Oliver. (note: the album also saw an earlier release exclusive to Japan via P*Dis). Released to celebrate Guzzetti’s first official tour of Japan, Waiting for Spring is a compilation of rarities, album outtakes, and demos that blends together surprisingly well. Included here is a demo of a track from his forthcoming second volume in the At Home – Piano Book series as well as a contribution to Nils Frahm’s Screws Reworked project. Jump around or listen all the way through – either way there is lots to enjoy here even as it demonstrates the broad range of the composer’s style & imagination. The very limited handmade CD edition of Waiting for Spring is intended to be sold only at his shows, but a digital copy can be obtained from both the Stella Recordings and Home Normal Bandcamp sites. Note: there is a slight difference between these releases – the Stella edition replaces “Scusa (end titles)” with a bonus remix track. 春を待っています (Waiting for Spring) is available in digital from Home Normal and directly from the artist. A very limited number of CDs were produced to be sold at concerts only.